FAMILY MATTERS DOJ Second Chance Fellow Daryl Atkinson (center) attributes a family culture of support to his success after prison. The men on the panel come from all walks of life: a former police chief, an ex-offender, and an advocate for newly released prisoners. Each speaker dives into his personal story and experiences, sometimes punctuating comments with a national statistic on incarceration. Different journeys converging to address a single issue: ex-offender reentry. 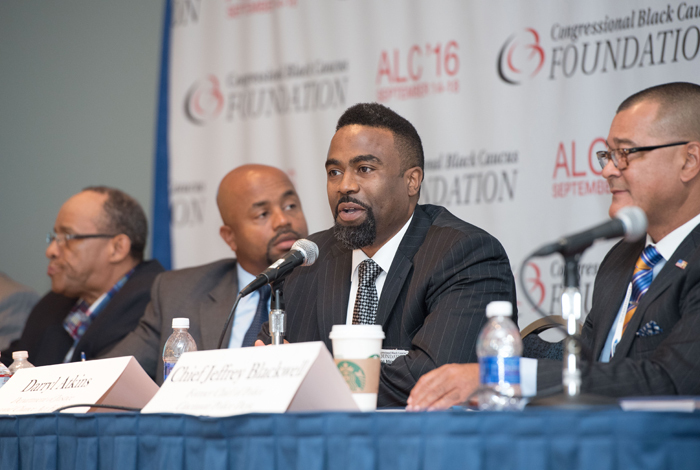 This 2016 forum, hosted by Davis during the Congressional Black Caucus Foundation’s 46th Annual Legislative Conference, examined programs and initiatives that are helping fathers and other returning citizens successfully transition back into the community and rejoin their families. These are important issues that must be addressed, Davis said, not only because having a criminal record oftentimes negatively impacts employability, but also weakens the black family structure. The congressman explained that there are children who grow up without the opportunity to see – or know – their fathers. “I don’t know a single black family that is not impacted by this issue of reentry,” Davis added. Years later, he would ask why they rented such a fancy car on the day of his release. The simple answer: “To show you that period in life didn’t completely define you, and we have a set of expectations for you now that you’ve returned home.” With that family culture of support, Atkinson has gone on to earn a series of academic degrees (from associate’s to Juris Doctor), is licensed to practice law in Minnesota and North Carolina, and has been honored by the White House as a “Champion of Change” in removing barriers for people with criminal records. “The only thing that separated me from them is that I had that loving support system and an environment where I could succeed,” he told the audience. Similarly, DOJ is also pushing initiatives to support the success of those transitioning back into their communities. The Bureau of Justice Assistance has issued more than “700 grants totaling over half a billion dollars” to reentry service providers nationwide for transitional services like housing, job training, food and shelter, said Atkinson. On the policy front, the Office of Personnel Management has proposed a rule to “ban the box” for federal employment, giving people with records a “fair opportunity” to get a job. Under his leadership, the Cincinnati police department started programs like “Right to Read,” putting officers full time in elementary schools to teach third graders how to read. “Why not interrupt the cradle to prison pipeline by helping these young brothers and sisters pass that test?” he asked. His leadership style, however, didn’t go unchallenged. He was fired from that position in 2015. Meanwhile, Albert “AL” Long, vice president of the Juvenile Justice Division for Correctional Management & Communications Group, also in Cincinnati, has adopted a “creative” approach to helping those reluctant to change. It’s a three-week program structured like a “professional bootcamp” that he believes can be used by correctional institutions and halfway houses. “There is no option for failure,” he stressed. The program emphasizes networking, self-awareness and conflict resolution. Community partnerships are key to these individuals transitioning into the workforce, with partners providing interview-appropriate attire like suits and dresses, and rigorous job interview prep. For Halbert Sullivan, changing the mindset is the first step in changing lives. “If a person isn’t ready,he may pretend, but he’s not going to do too much,” said Sullivan, himself a recovering drug addict with multiple stints behind bars. When ready, he made a life change and went on to earn a master’s degree. As the CEO of the Fathers’ Support Center in St. Louis, Mo., he strives to reconnect black fathers to their families and communities. The goal of the organization he founded in 1997 is to get fathers involved – and employed – to alter the “trajectory” of their children. Sullivan cited statistics indicating that in homes with absent fathers, children are more likely to use drugs, drop out of high school, and become juvenile offenders. He said teenage girls are more likely to get pregnant and continue the cycle. But a challenge for many of these fathers: a background with felonies. It’s a reason reentry work became a key component of outreach. “We work with a project in the penitentiary where we go in and provide parenting and other relationship skills building,” explained Sullivan. “But we also take a family therapist in so we can begin to reconnect [fathers to their families],” particularly the kids. The panelists laid out programs aimed at making a positive impact on the lives, communities and people they have served. Their storied paths have taken them to the front lines of the reentry discussion, including bringing them to this year’s forum helmed by Davis. “I have a lot of respect for people who take the tough challenges,” Davis said during the two-hour panel. Observers might argue Davis is one of those people. 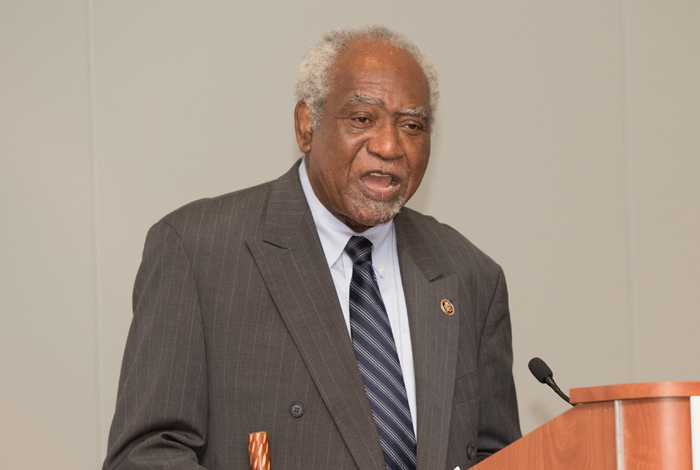 As a longtime champion of legislation to help ex-offenders, he spearheaded the Second Chance Act. It aimed to reduce recidivism by boosting resources for transitional services available to the formerly incarcerated. With the millions of people in this country with records, according to Davis, reentry issues are increasingly on the radar of leadership and policymakers at the state-level. “We are indeed making progress with this issue,” said Davis, but there is more to be done to whittle down the numbers.